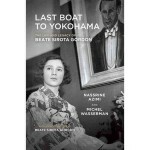 Akiko Yosano was born in Sakai, a port city near Osaka, to a wealthy merchant family in 1878. 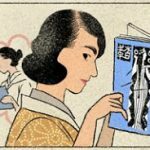 While her parents were disappointed that Akiko was not born a boy, Akiko was determined to not live the life of an “ordinary woman.” She loved to read so she took advantage of her father’s extensive collection of books which included foreign texts as well as classical Chinese and Japanese literature. As a teen, she became enamored with poetry, particularly with the poetic form called tanka. Akiko had an intense internal emotional life and she funneled these emotions into her poetry. She began publishing her poetry locally at sixteen and it became her mission to write not just great poetry, but help update the form for the modern age. Published in 1901, her first collection of poems, Tangled Hair, propelled her to fame and today it is still a part of modern Japanese literary canon. Akiko was an incredibly prolific writer of both poetry and essays; one cannot not escape the influence of Akiko Yosano. If had to compare Akiko to an American writer, I’d would call her the Mark Twain of Japan. In 1911, when Raichō Hiratsuka began to put together the first issue of Seitō, she approached Akiko to contribute to the magazine. At that point, a contribution by the well-known and respected poet, would legitimatize the magazine. Raichō left meeting unsure of Akiko’s feelings–did she think it was a bad idea or was merely trying to warn her about a sexist backlash? Raichō determined it must have been the later, because Akiko’s series of verses called Rambling Thoughts was the first contribution to arrive. There’s some debate in literary circles about whether or not the poems in Rambling Thoughts should be read together or separately. What is for certain though is that the first tanka, titled “Mountain Moving Day,” became symnous with women’s empowerment. The poem was recited in 1975 at the declaration of United Nations’ Decade of the Woman initiative. In 1993, Doi Tanaka referenced it when she became the first woman Speaker of the House of Representatives. The day when mountains move has come. Or so I said. But no one believed me. The mountains have simply been asleep for awhile. If you don’t believe that either, fine. are awake now and moving. water dribbles through the leak in the roof, just like a snake. Odor of night-sweat, a sad scent indeed. The grinding teeth of a sickly child. hair falling to my shoulders, rustling like grass in a mountain stream. How pale it makes my face look. Floating this way on dirty water, it is a Moon Flower. Bardsley notes that this image of a woman’s pale face, is antithetical to Seitō‘s message–that women and girls should search for their “hidden sun.” Since we know that Rambling Thoughts was the first contribution to Seitō, did this verse inspire Raichō to dedicate her fiery manifesto to the Sun? We do know that associating women with the moon was the trend at the time. Perhaps this was the kick Raichō needed. But what is a Moon Flower? It’s actually a nickname for the white morning glory. 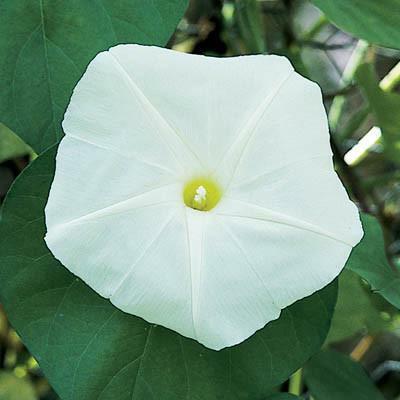 They are called Moon Flowers because they bloom in the evening and their shape and color is reminiscent of a full moon. 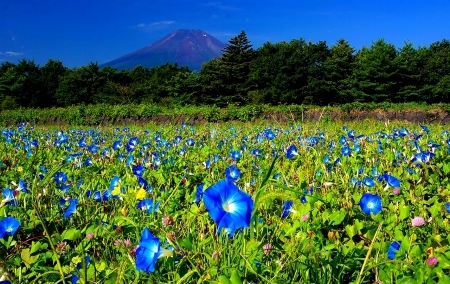 According, to FlowerMeaning.com, the morning glory represents love as well as duality. Love and duality? That definitely sounds like Sailor Moon! In Chinese folklore, the flower is symbolic of a story of star-crossed lovers. That certainly evokes the story of Serenity and Endymion. 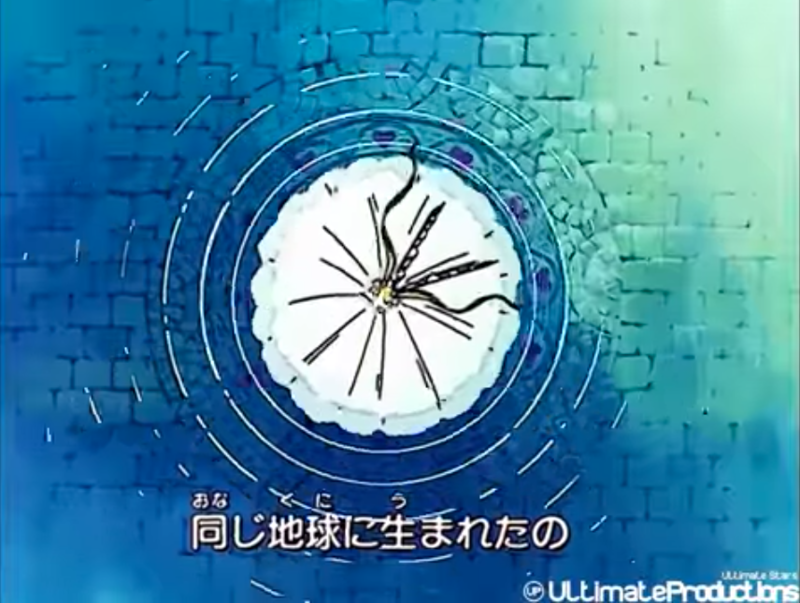 When I first saw an image of a moon flower, I immediately thought of this screenshot from the second opening of Sailor Moon. 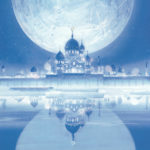 In this opening, Princess Serenity appears and the skirt of her white dress morphs into a white moon. Doesn’t it is also look like a moon flower as well? I think so. 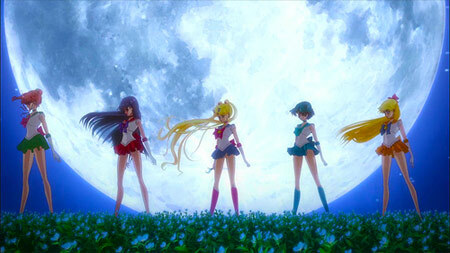 Flowers play a major role in Sailor Moon–who can forget Tuxedo Mask’s iconic red rose that he throws in the anime? Unfortunately, many appearances of flowers in both the anime and manga don’t seem to have a rhyme or reason, just whatever looks good in that particular situation. However, I would say though, it’s possible that moon flowers do make in an appearance in the first opening of Sailor Moon Crystal. I’ve noted before that it’s possible that Moon Pride was written with Raichō’s famous essay in mind. It seems to go out of its way to proclaim “Moon Pride” as well as to use the lyric “Shiny Make Up” to make empowerment happen. Standing in a field of blue morning glories may be another reference to early Japanese feminists, the Bluestockings. 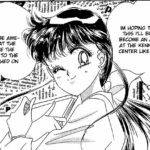 I don’t have any evidence that Naoko Takeuchi was ever directly inspired by Akiko Yosano’s poetry. However, the manga and the musicals do go out of their way to call Sailor Moon and the guardians, soldiers of the White Moon. 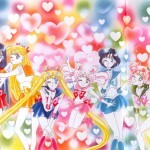 Not only that, but in the original plans for Sailor Moon, her hair was supposed to change from yellow to white. 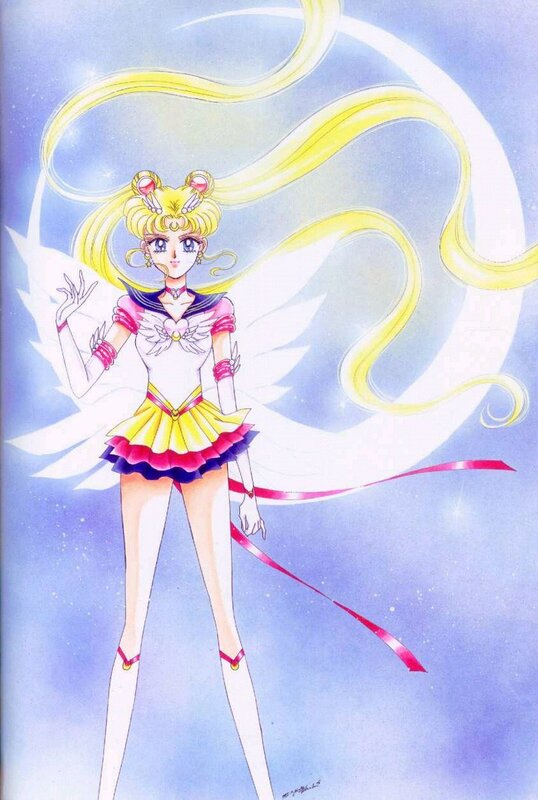 Additionally, the color white features predominately in the character designs for some of the most powerful characters in all of Sailor Moon such as Queen Serenity, Neo Queen Serenity and Sailor Cosmos. The color white is clearly an important motif in Sailor Moon. Evening Showers, one could interpret the imagery as sad–the woman’s light has been diminished by the world around her. However, I tend to agree with scholar Jan Bardsley, that the poem isn’t meant to be depressing, but to offer a glimmer of hope. After all, doesn’t the sun have to set? Where does one find light in the darkness of night? There’s something eternal and undefeated about the light of the Moon Flower. In fact, it puts the eternal in Eternal Sailor Moon, perhaps. As always another amazing post. I’m always impressed by your knowledge! Aww, thank you! And Japanese feminists are really cool! They really inspire me! 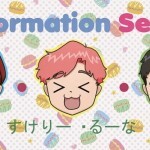 Previous post: A Beautiful World Full of Silver Crystal…And Equality?